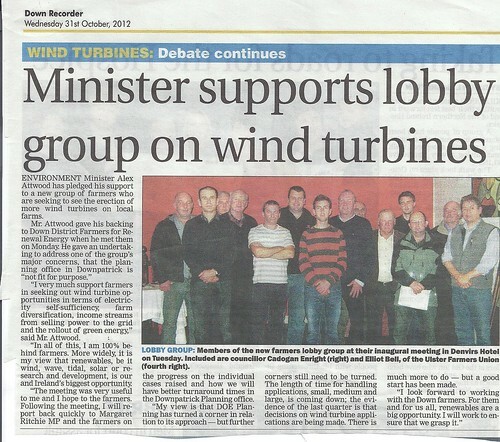 Minister supports Farmers on Wind Turbines Oct 2011, a photo by CadoganEnright on Flickr. 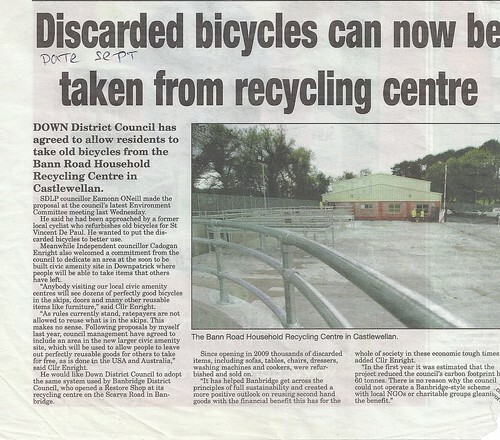 Bicycles can now be recycled, a photo by CadoganEnright on Flickr. 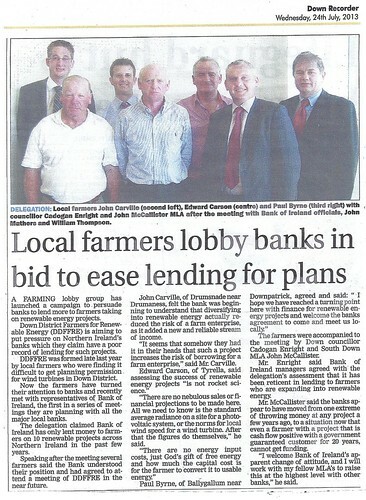 Councilor Cadogan Enright organized a meeting of farmers from the Down area with the Ulster Farmers Union following a series of planning decisions which he has described as ‘mercurial’. “This unequal treatment is unjust and creates a situation where the profits of renewable energy in Northern Ireland will be exported by big money interests, rather than kept in the hands of local people”, continued Cllr Enright. Farmer and wind energy expert Paddy Flynn of Castlewellan said, “Planning policy seems to be interpreted one way in County Down, and another way across N.I.. 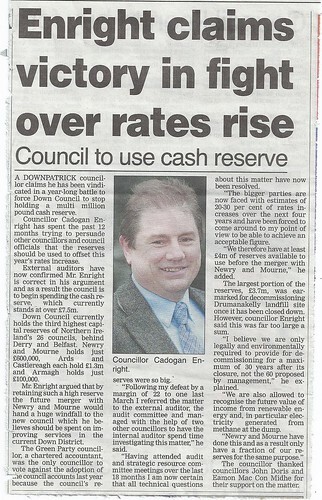 This does not help people like myself working to advance renewable energy in the rural economy”. Ulster Farmers Union representative Elliot Bell was extensively briefed at the meeting on 10 different planning issues, with farmers present to back up their complaints with detailed examples. 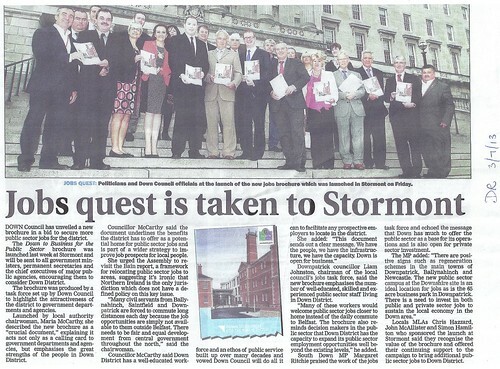 Elliot confirmed that UFU would be seeking to speak with senior planners about the interpretation of policy in Down. use cash not rates, a photo by CadoganEnright on Flickr. Councilor Cadogan Enright and local community activist Pat Ward have welcomed progress in their complaints to the enforcement department of the planning service at the Dunmore Road and Magherahamlet Road crossroads. They called for the remaining wall to be removed to avoid any further accidents, following a serious crash in the past week. Cllr Enright explained, “We had previously campaigned with planning enforcement to have a derelict building on the site which had been causing traffic problems to be removed, but it seems that while the rest of the house was demolished, a significant section of wall remains and this continues to block the sightlines of road users approaching the crossroads from the Spa direction. Pat Ward said “It took over 18 months of pressure from the Green Party for the original ruin to be demolished, and it had been there for 10 years. 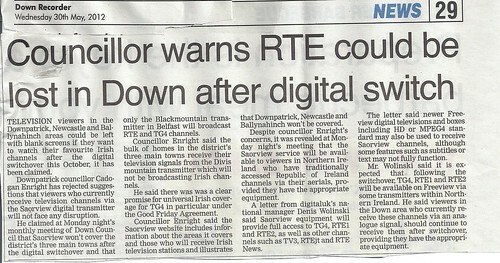 We hope it wont take the same amount of time to have the wall demolished as it is a serious hazard.